I’ve finally decided something about this whole afterlife thing. When I die, I want to go to a heaven designed by Studio Ghibli. Whether it’s the open fields of Howl’s Moving Castle, the magical forests of Mononoke or Nausicaa, or the springtime in Tokyo of Whisper of the Heart, the world is a beautiful place when it’s been drawn by Ghibli. The story opens on a good day for Shizuku. It’s an excellent, well-observed presentation of what “a good day” means to a girl in junior high. It’s spring. There’s a blimp outside, coloring the sky. It’s a little hotter than usual, maybe the first time this spring that it’s been warm. School is almost out for summer. And your friends are calling your name, just to say hi. Nothing earth-shattering is happening; it’s just that everything — each little detail — is a little better than usual. One of the best thing about Whisper of the Heart is how well-observed all the little details are. It’s not that the style of drawing is lifelike; rather, it’s how uncanny the movements, behaviors, and details are. Shizuku crosses a street at an angle and checks for cars in a what that suggests complete familiarity with the street. Arriving at home, there is a swarm of bugs around the fluorescent light fixture. These details add nothing to the story, and yet they add incalculably to atmosphere and appeal of the film. The story itself is refreshingly simple. Shizuku is starting to think about life after junior high. She likes writing and has a way with words, but what does one actually do about it? One day she follows a cat to an antique store that charms her. The proprietor is a nice old man with lots of good stories to tell. She initially distrusts his son, who seems stuck-up, but when she discovers him carefully chiseling the neck of a violin, they get to talking. She discovers that he wants to be the world’s greatest violin-maker. His own passion inspires her to really try to write something; to test her mettle and see if she has what it takes. As with Kiki’s Delivery Service, the conflict in the movie is almost a non-conflict. 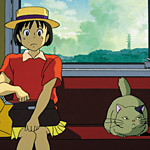 Some Miyazaki fans find Kiki too sweet, and they’ll undoubtedly say the same about Whisper of the Heart, directed by Kondo Yoshifumi, but written by Miyazaki. Whisper is about self-discovery, and not much else. And yet, the movie is about so much more than its plot — the visuals, the tone, the atmosphere — that anything more complex would simply detract. I might concede a little ground to any detractors. The ending scene is a little... weird... if heartfelt. And the very opening shot, of Tokyo, accompanied by a grand, bold chorus of “Country Roads” is also a tad strange. Corny, even. But the opening and closing make a little more sense in the context of the good-natured and innocent movie that lies between. As with previous Disney re-dubs of Miyazaki films, Whisper of the Heart has a very well produced English language audio track. In fact — and I’m surprising myself by saying this — the English-language dub is better than the subtitled version. The Japanese-language audio track has its own charm, but in the English dub the story is clearer and the language more natural than in the subtitles. There is one major snag with the translation, and it involves a key scene wherein our heroine is trying to find the right translation to “Country Roads.” Doing the double-translation back into English is just confusing, whether in the subtitles or in the dub. Whisper of the Heart was released last week, along with Howl’s Moving Castle and My Neighbor Totoro. I believe this marks the day when all of Studio Ghibli’s films are finally available in the United States. We all owe Disney (and John Lasseter) a hearty thanks for having the vision to bring these films to Americans. Like all the other Disney/Ghibli DVDs, this one has a “Behind the Microphone” feature, and a separate disc with the Japanese Storyboards. It also has a batch of Japanese TV and movie trailers. The interesting thing about the Japanese TV spots is that some of them seem to openly question the production of such a film. The subtitles read “For some reason, in this age, young girls comics....” Young girls’ comics what, they never say, but the implication is that the marketers are baffled by the popularity of the source material on which Whisper of the Heart is based. Hardly seems like a sound marketing tactic. Maybe it got lost in translation. The visuals of Whisper of the Heart are heavenly. The film is a decade old, so I expected to see the odd scratch or dust mark, but the DVD presentation is remarkably clean. Whether the movie was simply well-preserved, or restored and remastered, this DVD is gorgeous. The music on the Japanese audio track sounds a little richer and rounder, but both the Japanese and English tracks sound very good.